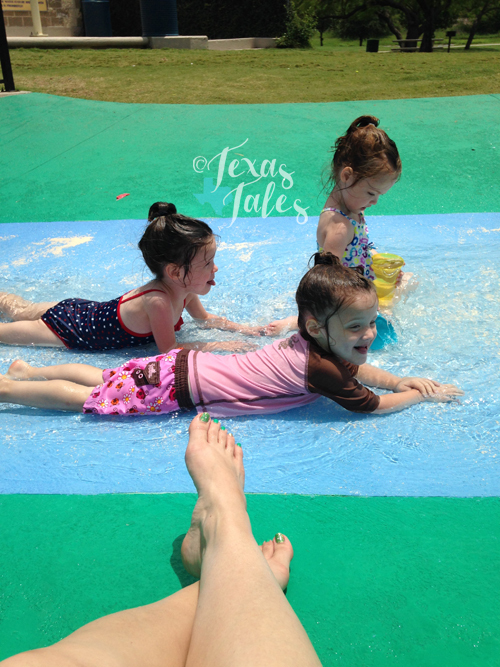 There's nothing better than soaking up some rays while watching your kids laugh and play in the water! And the splash pad is great because the only standing water is the little "river," pictured above, which isn't deep at all so I don't have to worry about the kids capsizing in a pool. Whew. I tried to list links to comparable items for some of the things I couldn't find online, like my trusty chevron striped cooler bag. That thing is awesome! It's the perfect size to hold our lunch without having to lug a big, bulky bag and I just cram it with some frozen ice packs to keep everything cool until it's time to eat. The Sistema tupperware have really come in handy since they're small and divided, which makes it easy to toss in lunch meat and cheese on one side and maybe nuts or chips on the other. I also make quesadillas, pita pizzas and other easy lunches to eat picnic-style. The kids have been loving Vita Coco's flavored coconut waters, which are a great way to help keep them hydrated as well. 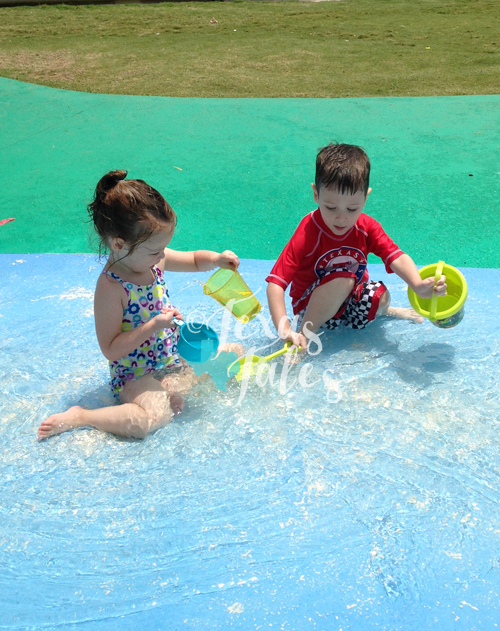 The buckets were a great little find at our local Dollar General store, and the kids fill and dump them hundreds of times while we're at the splash pad. I usually stock up on several at the beginning of each summer to use for water, sand and play in general. My cute jute tote has plenty of space after towels, sunglasses and everything else, so I'll toss in some extra solo cups or cheap plastic measuring caps for them to play with as well. We've stayed sunburn-free so far thanks to my trusty Aveeno Baby sunscreen. I prefer to use Aveeno products since Harrison has sensitive skin and it has worked very well for us. 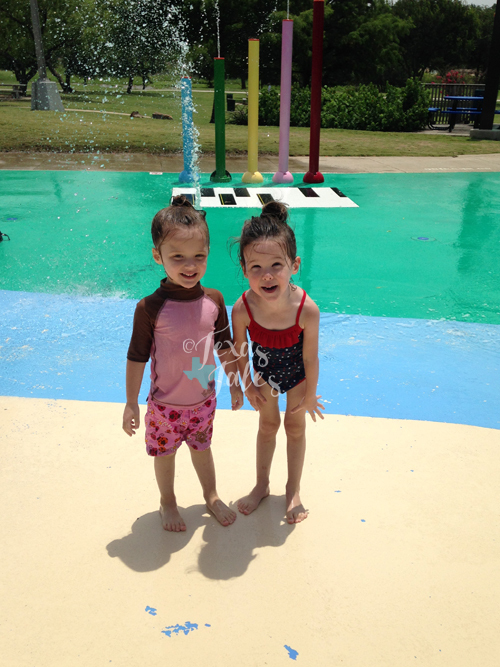 Since I put sunscreen on the kids long before we leave for the splash pad, my own sunscreen is usually an afterthought. I don't like heavy coverage and usually prefer tanning sprays, but I've been liking Banana Boat's dry oil spray. I'll even spray some in my hands to rub on my face and the SPF 15 has proven enough to prevent any burning. When it comes to anything coconut-scented, I'm a fan so when I smelled the after sun lotion at Walgreen's I had to bring some home. It smells and feels great and was only $2! So was the aloe vera cooling gel, which the husband already had to use since he forgot to apply his sunscreen during our splash pad trip over the 4th of July weekend. 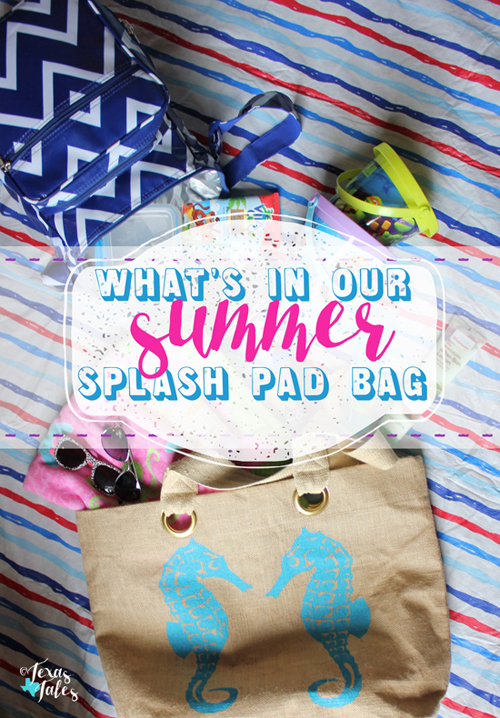 And that's what goes in our splash pad bag for summer! What are your water-side go to products? 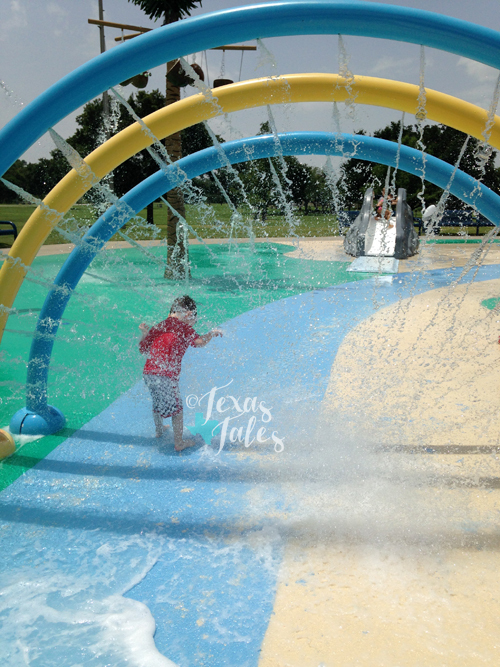 I wish my kids loved the splash pad like yours do! We will have to practice with the sprinkler at home so we can join you one day soon. I like the sunscreen stick for kids faces, aveeno has one. It's easy to apply and won't run into eyes. I'm looking for your spray oil, I love that scent too! 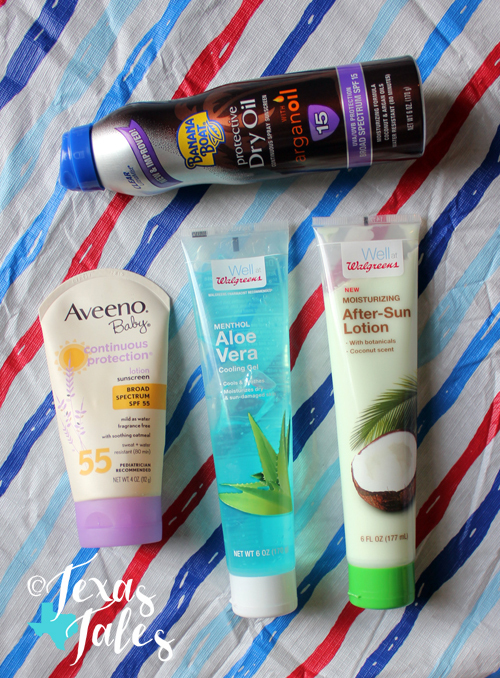 I use the same Aveeno sunscreen for my kids since they both have sensitive skin. 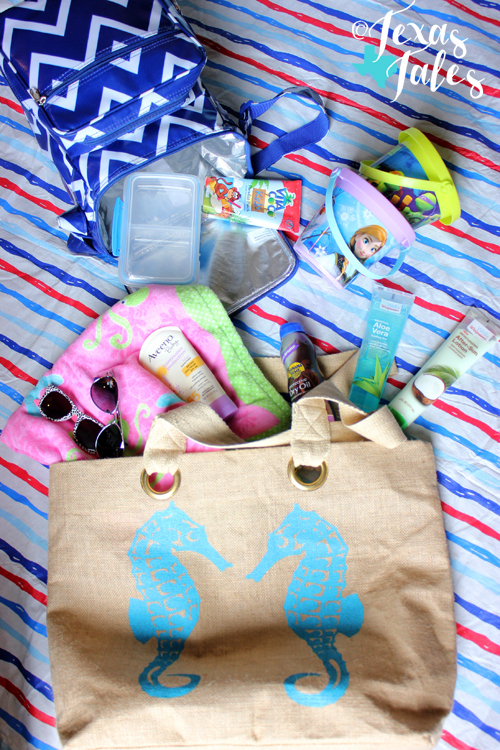 Have you heard of Pack-It cooler bags? The "ice packs" are built in, so you freeze the bag itself. It stays cold for-ever! And it can even chill food / drinks if you put them in the bag at room temp!